Polygon2: Make your bigger dreams come true with Polygon2. 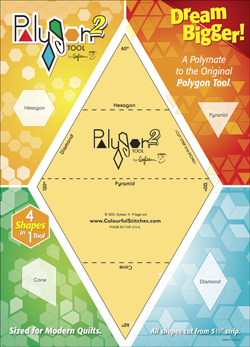 Great for "Modern Quilts" and is the Polymate to the original Polygon Tool. All 4 shapes (Diamond, Pyramid, Hexagon and Cone) cuts from 5 1/2" strip. Note: Shipping and handling rates are included in the pricing for domestic orders. Maryland state sales tax will be added to the total for Maryland state residences; this will be calculated during check out. For Wholesales Orders, send email to: [email protected] for wholesale pricing.